The long and arduous process of electing (or selecting ?) the President of Afghanistan which began on August 20; finally came to an end, albeit on a somber note when on November 1, the formidable candidate Dr Abdullah Abdullah quit the run-off elections as scheduled on November 7. He expressed his dissatisfaction towards the ‘election procedure’ and the ‘associated fraud’. Hence, on November 2, the incumbent Hamid Karzai was declared president for another five year term by Azizullah Ludin, the chief officer of the Independent Election Commission (IEC). Interestingly, Karzai himself appointed Ludin to the office and Abdullah had raised vehement objections regarding the ‘biased attitude’ of Ludin. In fact, it was a major issue on which Abdullah relinquished his candidature. The Afghan Law does not allow the third candidate in the fray to contest the run-off when the second bows out. Thus Bashardost could not pose any challenge to Karzai as per the rules. But all is not well for Karzai. It may be ‘joie de vivre’ for him for the time being, but President Obama has clearly warned him to work against the rampant corruption and opium trade that have encouraged the resurgence of the Taliban. Already, General McChrystal has categorically stated in his report that drug trade is one of the chief financial support mechanisms for the Taliban. Ironically, even Vice-President Fahim is charged with malfeasance. Hence, Karzai’s tasks would not be straightforward. The US administration wants Mr. Karzai and the Afghan government to put into effect an ‘anticorruption commission’ in order to establish strict accountability for government officials at the national and provincial levels. In addition, some American officials and their European counterparts would like to see at least a few arrests. 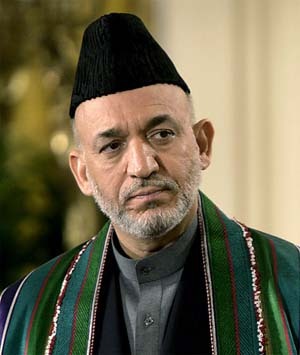 The international community’s wish list of potential detainees includes Mr. Karzai’s brother, Ahmed Wali Karzai. He is a suspected player in the country’s booming illegal opium trade. Another player in the same league is General Abdul Rashid Dostum, accused of involvement in the killings of thousands of Taliban prisoners of war early in the Afghan conflict. Furthermore, Fahim is on the wish list too. Just after the declaration of the IEC, the fifty-one year-old Karzai, quite paradoxically, urged his Taliban ‘brothers’ ‘to come home and embrace their land’. What type of strategy is he following? Is he calling upon the souls of the patriotic Talibans to solve this quagmire? The fitting question in this regard is will the Taliban or for that matter ordinary Afghans pay heed to Karzai’s appeal? Keeping in mind the kind of maladministration that his government has rendered for the last five years, the scenario seems bleak. Moreover, the recent revelations of the unholy connections of Karzai’s brother with the CIA have made the situation in Afghanistan more cumbrous. Some analysts have said that there was immense pressure on Abdullah to quit, as Karzai was the only choice of USA. But that might not have been the case as some reports do suggest that the Obama administration, in its early days tried its best to search for another ‘pliable’ alternative to Karzai. They did not succeed in that endeavour though. In a more probable scenario, Abdullah might have understood that even if a ‘semblance’ of an election took place, it would have been difficult for him to defeat Karzai. More so, when the voter turnout remains a contentious issue amidst Taliban threats. By now, it is an accomplished fact that ‘lack of governance’ in Afghanistan has been a major plank for the Taliban re-emergence. Thus Karzai has to plug in the loopholes. Moreover, a politically stable Afghanistan is a pre-requisite for the phased withdrawal of the NATO-led forces. Also, to thwart the Taliban, revival of democratic and judicial structures is of utmost necessity. Another ‘friendly government’ for five more years and Obama has obtained the verdant field to send his troops. Enhancement of American troops in Afghanistan as per the request of McChrystal is now almost unavoidable. Actually, White House is playing a ‘wait and watch policy’. It is keeping vigil on the Pakistani operations in South Waziristan. And it would also keenly watch Karzai live up to his promises to combat jobbery. The success of both Pakistan and Karzai, even to a partial degree, would set the stage for an American onslaught in Afghanistan. In the meantime, Karzai needs to pounce upon this opportunity. If he can create a conducive political atmosphere for the ordinary Afghans, cut down on the illegal opium trade and most importantly restore the confidence of the ordinary masses in democratic governance; then a new sunshine may occur in a war torn country. Needless to mention, this opportunity is Karzai’s last one.